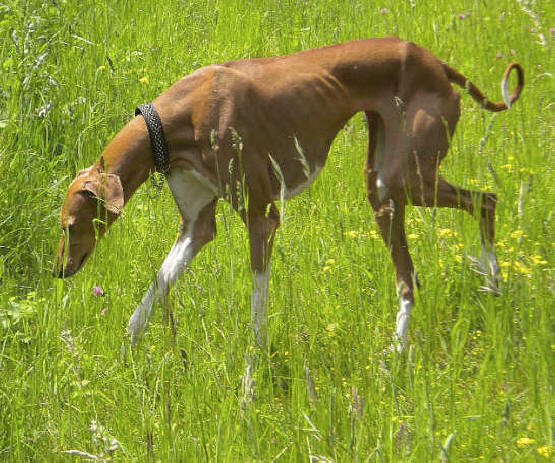 Tidet is one of the very rare hounds in my life in which case - when I was holding them in my hands after the birth, still wet and connected to their mothers with the umbilical cord - I felt immediately without any doubt that they would stay with me. 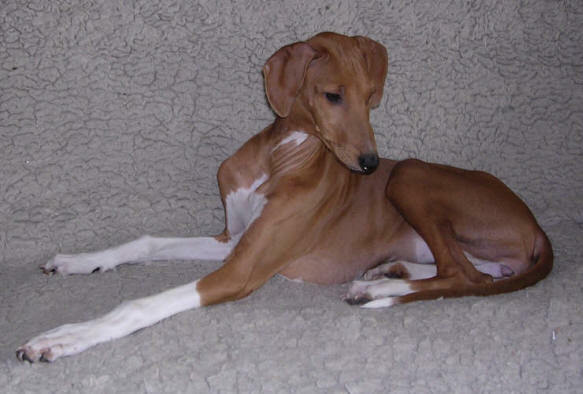 This does not depend on coat colours or markings, but it is a feeling, a kind of a vibration, which has grown in me towards one individual puppy in only a very few cases during my life as a breeder. I have always followed this feeling and I have never had to regret it. These special Azawakhs always had the closest bond with me. 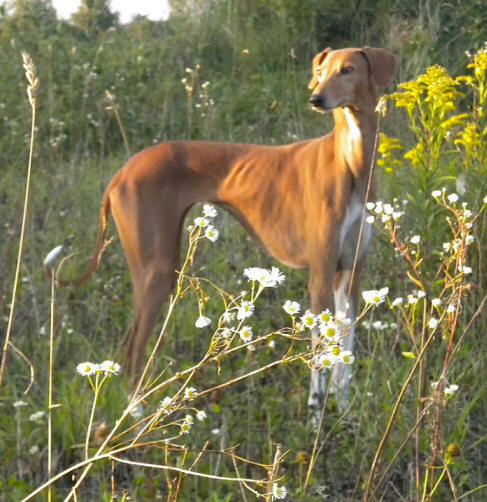 Tidet has matured into a noble female with a very nice high rectangle format, long legs with open angulations and a beautiful expressive head. She has a strong charisma and presence. 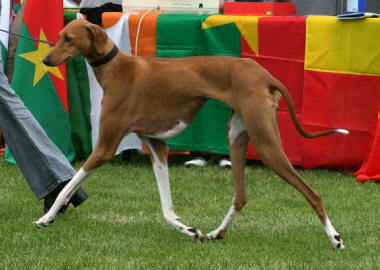 She is usually the favourite of my visitors here, as to a high degree, she embodies the idea of the classic type of an Azawakh preferred and selected in European breeding lines. 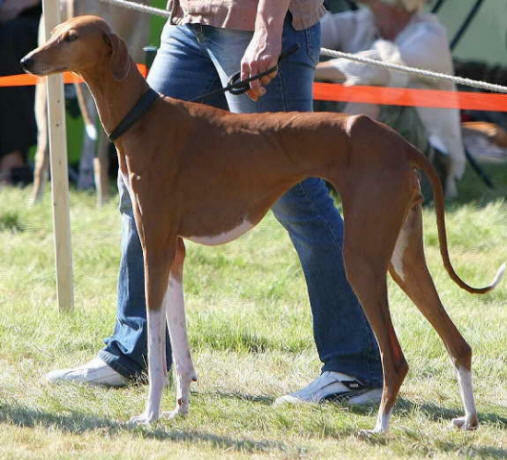 And the majority of the breed lovers still prefer shining red coat with high white socks, even though the breed appears in a variety of other colours and markings. 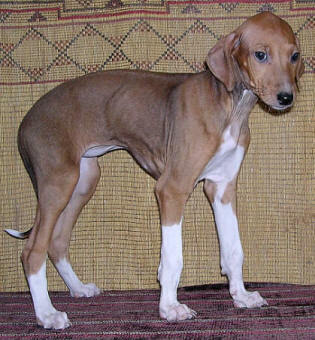 Even though Tidet resembles a classic “high-cast type” of the Azawakh created during the last 40 years of the breeding history and selected from the first African Azawakhs imported to Europe, she is a result of a well-thought breeding strategies for several generations, which includes also the integration of desert-bred Azawakhs from the Sahel in her ancestry. 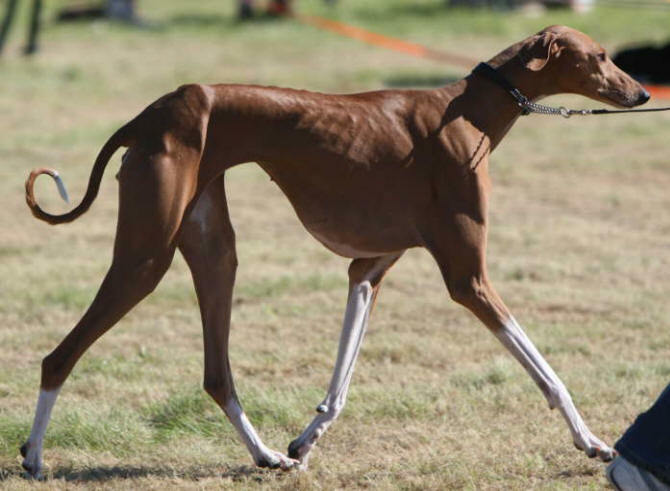 Four Azawakhs imported from Mali and Burkina Faso - Amanar, Tainoss, Abarout ak TinAkoff and Salome – have contributed to her low coefficient of inbreeding, and her genetic heterogeneity is clearly increased in comparison to the so called high-cast breeding lines. 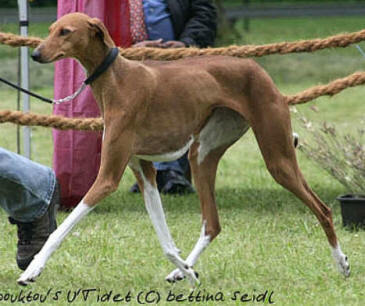 Since the beginning, Tidet has developed an extraordinary close bond with me. If she could, she would be “glued” to me every step of the way. We attended a puppy school where Tidet finished her initial training in a very short period of time, only after a couple of classes, because she learned very fast and could easily pass to the next level. Winter stopped us, because low temperatures, snow and rain are not really ideal conditions for training an Azawakh. Until today, Tidet loves doing exercise with me, or doing anything only with me without the rest of the pack. She is not really involved in the pack, even though she gets along with the others well. Tidet is a great-granddaughter of one of my foundation females, Al Hara´s Zaket, and Amanar, imported by me from Mali in 1996. 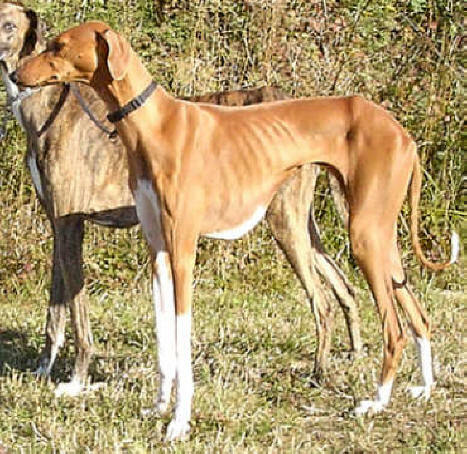 I hope her future offspring will carry on their genes, so meaningful and important for me and my kennel. 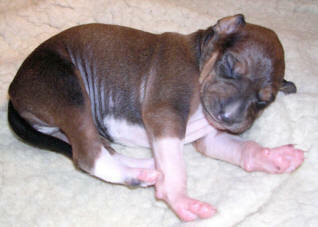 Her first litter was born only four days before her fifth birthday. This was a very exciting moment for me, because we already had two matings without getting Tidet pregnant. But the quality of this litter compensated for all the frustration experienced before. Now they are spread out all over Europe.